The first time I read the recipe for this month’s challenge, I cringed. I thought, err what is BSP (Baker’s Percentage). It didn’t look like any normal bread recipe at all. But after consulting the milis, read the article etc, I sort of get what it means. But I really couldn’t explain much, if you like you could go ahead here and have a good reading yourselves. What I’m going to share now would be the whole bread making process. I did just as the formula suggested, just reduced the sugar to half amount as I read on the milis that if you put all amount of sugar your bread would be way too sweet, and I didn’t like overly too sweet bread. I also reduced the amount of salt as I felt it was a bit tad too much for my taste. As I have done many times of kneading bread (or pizza) with barehands many times before, I made this bread with my mixer. It took 15 minutes on speed 3 until the dough passed window pane test. This test I would never know if it wasn’t for KBB, There’s always new things I learned every challenge. If you are wondering what is it all about, just read it here. Oh I almost forgot one thing, the egg in the recipe called for 38.5 gr which means less than one egg, so as advised on the milis that you could use the whole egg but then you should compensate the other liquid you use which was water. So I did just that, used up the whole egg (60 gr) then reduced the amount of water by 21.5 gr. Now it’s winter time in Europe but dough likes warm spot in order for them to rise. At first I put my dough on top of the heating, and it worked ok. But then on the second fermentation I put them inside the oven with very low temperature (30celcius). I moved the poor dough because the cats had been eyeing on them since the first time I put it on top of the heating. Other things that I was not sure about was the fermentation time, there were many versions in the explanation and milis. But in the end it came to a conclusion that you shouldn’t let your dough rise twice it’s starting size because then it would be what we call “over fermentation”. So mine was; first fermentation 1.5 hours and second fermentation 45 minutes. I was a little bit creative actually with the filling, but sorry forgot to take picture of the roti isi (filled rolls). Besides plain dinner rolls I also made some rolls with filling; chocolate, milk and spicy hot tuna. Next time I make this bread I would surely take pictures. My bread turned out beautifully, just 15 minutes in the oven. And what surprised me the most that after 2 days (I kept some to eat and test the next days) it was still soft and moist. As I made bread before both with and without bread improver this bread was really good for a bread that has got no added chemical besides the yeast itself. YAY to KBB for founding this recipe, another new baking knowledge! quart bowl (or in the bowl of an electric mixer). Pour in the egg, butter and water and mix with a large metal spoon (or on low speed of the electric mixer with the paddle attachement) until all the flour is absorbed and the dough forms a ball. If the dough seems very stiff and dry, trickle in more water until the dough is soft and supple. e test and register 80oF. Lightly oil a large bowl and transfer the dough to the bowl, rolling it to coat it with oil. Cover the bowl with plastic wrap. – Ferment at room temperature for 1.5 to 2 hours, or until the dough doubles in size (the length of time will depend on the room temperature). – Remove the fermented dough from the bowl and divide it in half for sandwich loaves, into eighteen 2-ounce pieces for dinner rolls, or twelve 3-ounce pieces for burger or hot dog buns. Shape the pieces into boules for loaves or tight rounds for dinner rolls or buns. Mist the dough lightly with spray oil and cover with a towel or plastic wrap. Allow to res for about 20 minutes. – Shaping. For loaves, shape like rolling a Swiss roll but pinch the crease with each rotation to strengthen the surface tension. Pinch the final seam closed with the back edge of your hand or with your thumbs. Lightly oil two 8.5 by 4.5-inch loaf pans and place the loaves in the pans. For rolls and buns, line 2 sheet pans with baking parchment. Rolls require no further shaping. For hot dog buns, shape into a pistolet without tapering the ends. Transfer the rolls or buns to the sheet pans. – Mist the tops of the dough with spray oil and loosely cover with plastic wrap or a towel. Proof the dough at room temperature for 60 to 90 minutes, or until nearly doubles in size. – Preheat the oven to 350oF for loaves or 400oF for rolls and buns. Brush the rolls or buns with the egg wash and garnish with poppy or sesame seeds. Sandwich loaves also may be washed and garnished, or score them down the centre and rub a little vegetable oil into the slit. 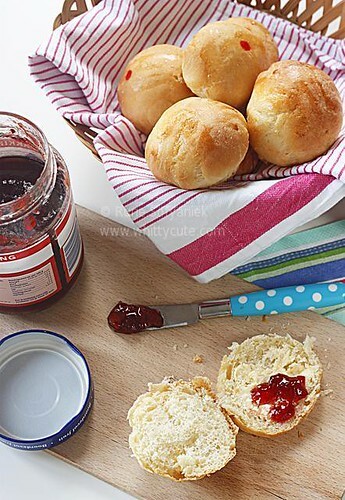 – Bake the rolls or buns for approximately 15 minutes, or until they are golden brown and register just above 180oF in the centre. Bake loaves for 35 to 45 minutes, rotating 180 degrees halfway through for even baking, if needed. The tops should be golden brown and the sides, when removed from the pan, should be golden. The internal temperature of the loaves should be close to 190oF, and the loaves should sound hollow when thumped on the bottom. – Cooling. When the loaves have finished baking, remove them immediately from the pans and cool on a wire rack for at least 1 hour before slicing or serving. Rolls should cool for at least 15 minutes on a rack before serving.